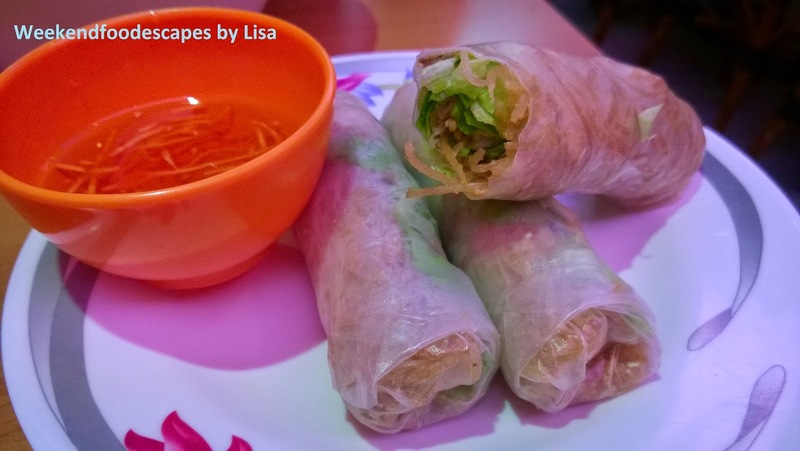 Are you looking for a quick, easy and consistent vietnamese restaurant? 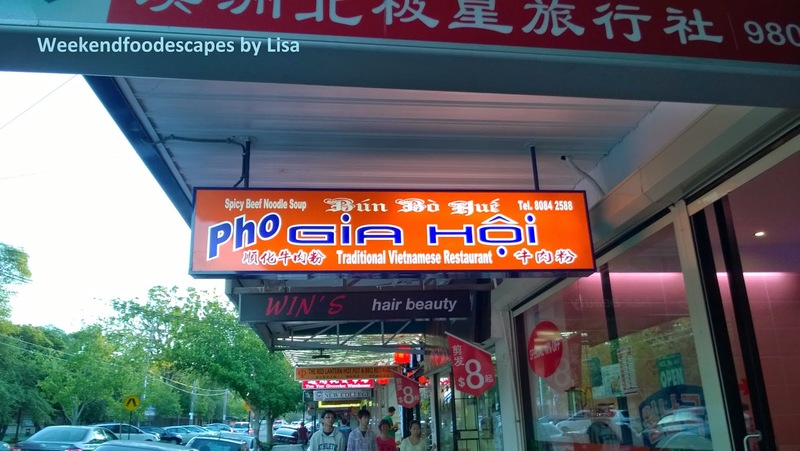 Pho Gia Hoi has a few chains in Sydney. 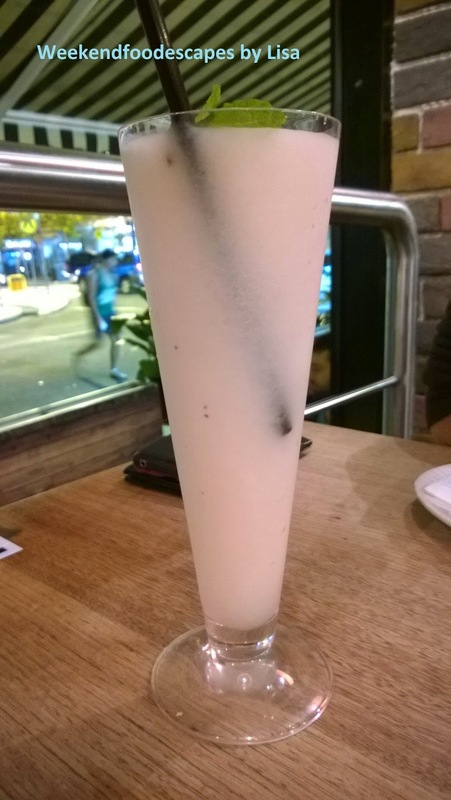 I've been to the one in the city, Bankstown and more recently my local hood - Eastwood. All of them are pretty cheap and cheerful. A nice cheap and cheerful place. I'd recommend you stick to ordering the Pho. 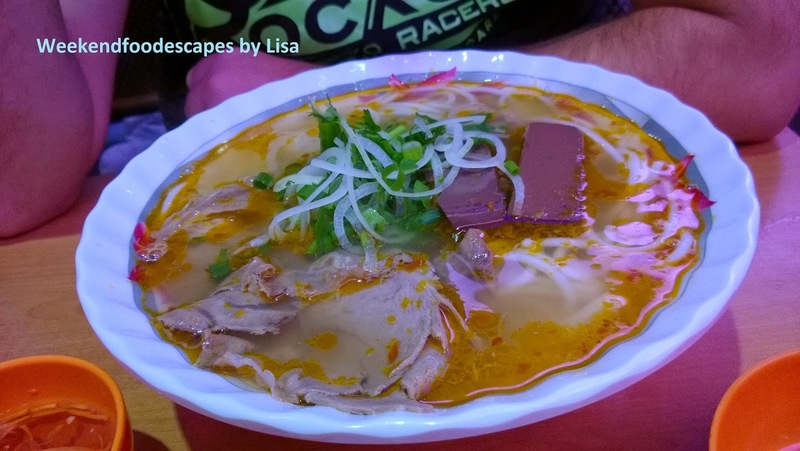 The Bun Bo Hue is something different but the Pho is what you want to order. 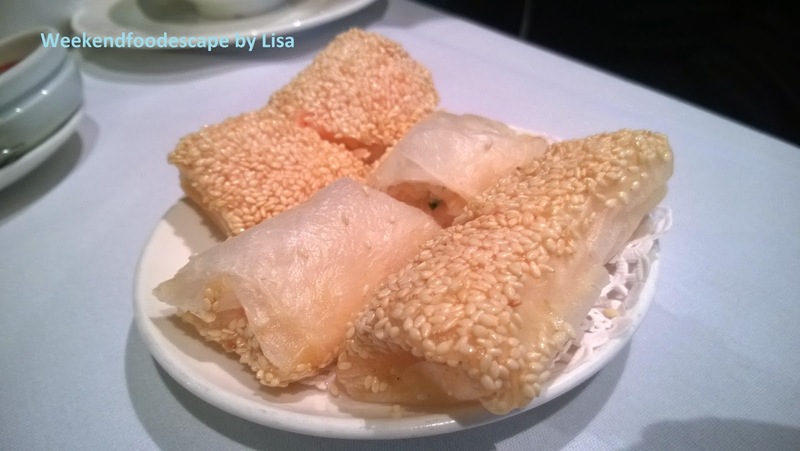 I also like ordering the bun with cha gio (spring rolls) but I ordered the combination on this occasion. They are just missing the Vietnamese pancake which is a dish I love eating! A nice cheap place to eat with free tea. This place is very busy because it's a beautifully decorated, the menu is extensive and the food is tasty. 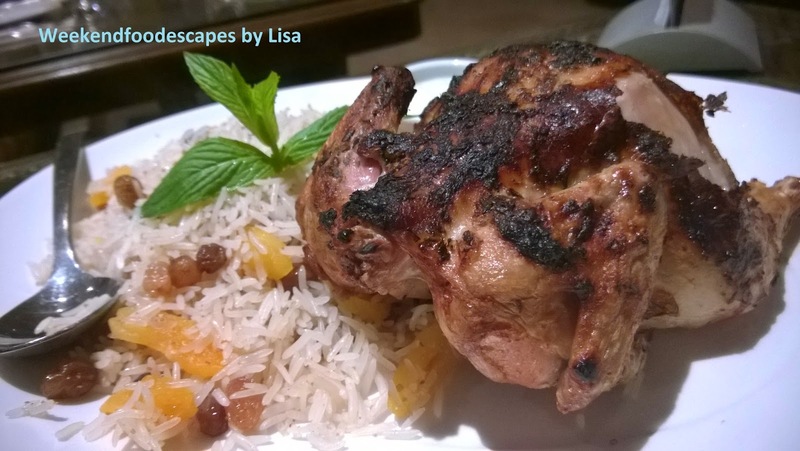 Highly recommended by a local; I came here on a Thursday night having very high expectations. I was not disappointed. 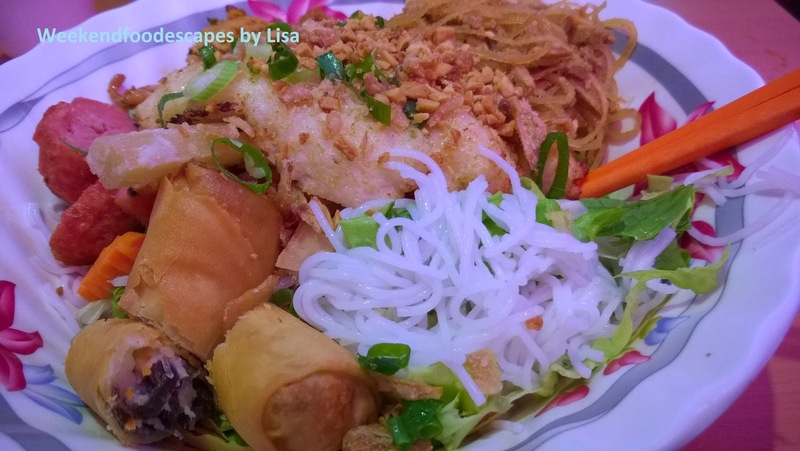 We shared a plentiful feast of roasted duck with rice, your classic pad thai and polished off a delicious dessert of pastry wrapped ice cream. 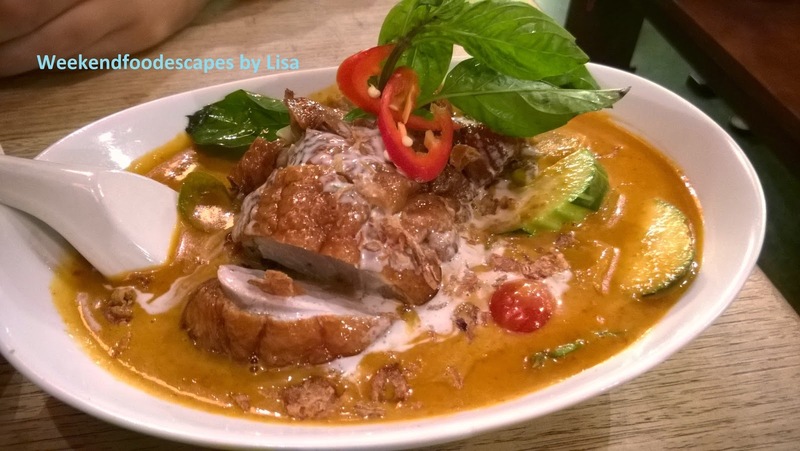 The duck was beautifully cooked with a complex mix of flavours of sweet and savoury, creamy, mildly spiced curry sauce. A definite recommend. 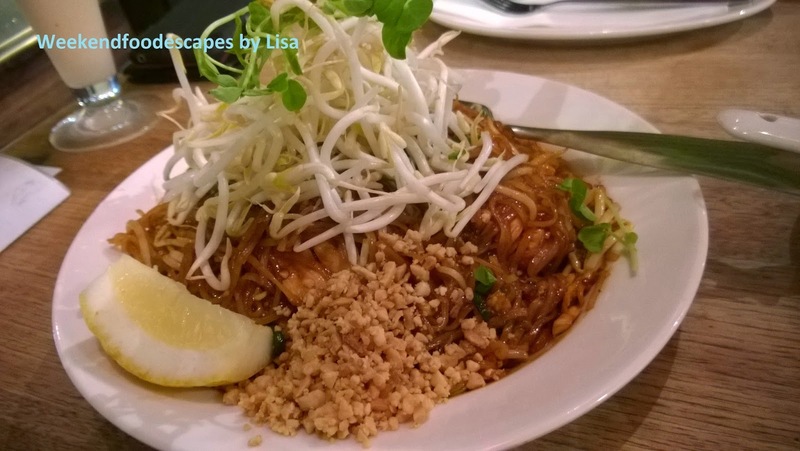 The pad thai was of the thinner noodle kind with your typical pad thai flavours. A nice and consistent dish. I personally prefer the thicker noodles with a touch of spice. The must have of the night was the fried ice cream. 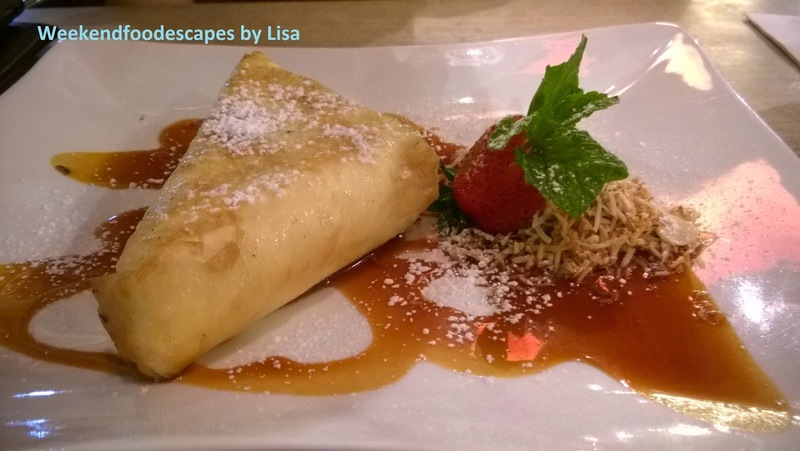 With lashings of caramel, coconut shavings and vanilla ice cream which was perfectly encased in cooked pastry - you will be having a foodgasm. Situated in Town Hall, a stone's throw away from my favourite bar to get drunk at. Sedap is always jam packed when I walk past. For a cheap solid Char Kuey Teow, come to Sedap. For $12 go wild and become entangled in tasty land. 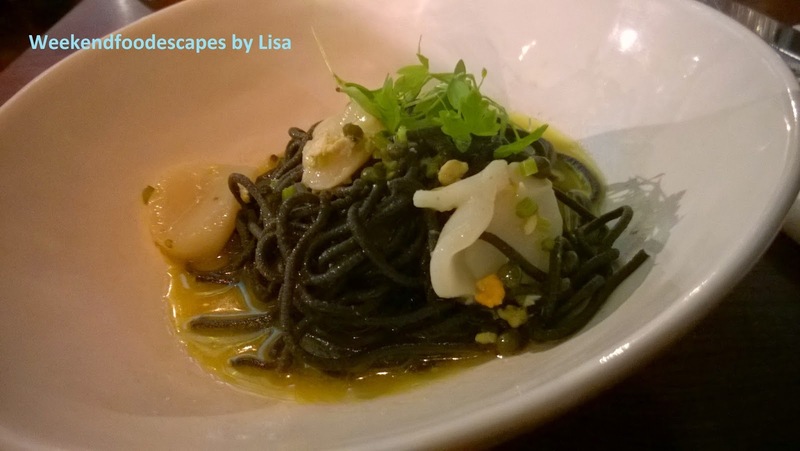 Everyone loves a good noodle dish. 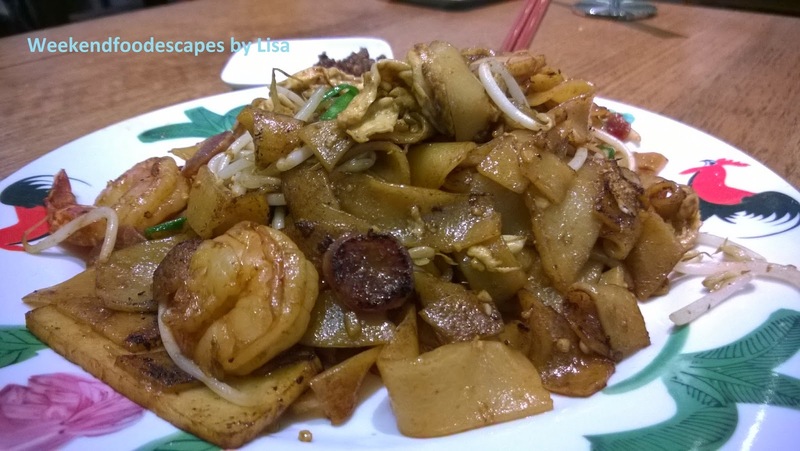 Char Kuey Teow is fast becoming one of my favourite asian dishes. I also tried the deep fried tofu which was something different. It was well fried and not oily with a non-chilli flavoursome sauce. 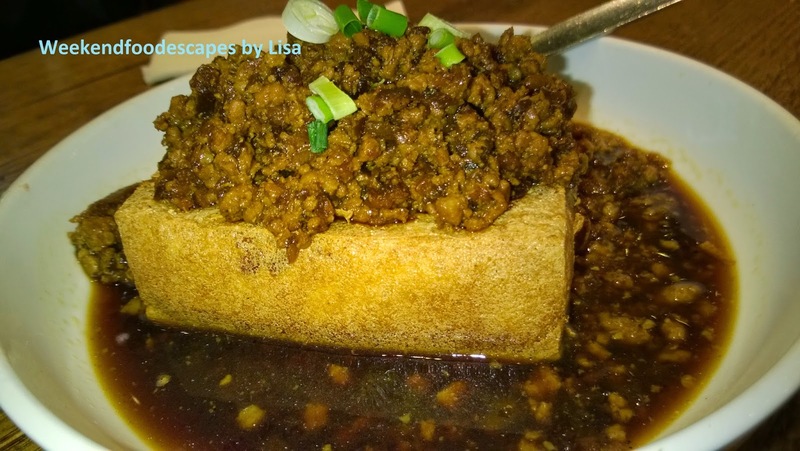 A good dish to share within a group if you are ordering several dishes. Otherwise I'd stick to delicious noodles. Speak clearly and repeat your order (or point) as some staff speak very limited English. It can become very busy. A nice cheap and cheerful place. Mains - $12-15 per person. Oh Yeah. The massive queue speaks for the high quality food. 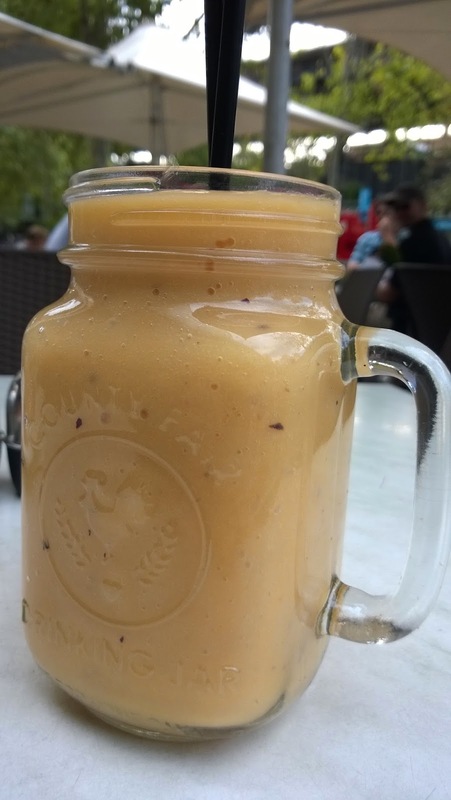 Situated in the food court of Berry Square, you would not expect the taste buds to dance so wildly as they do. 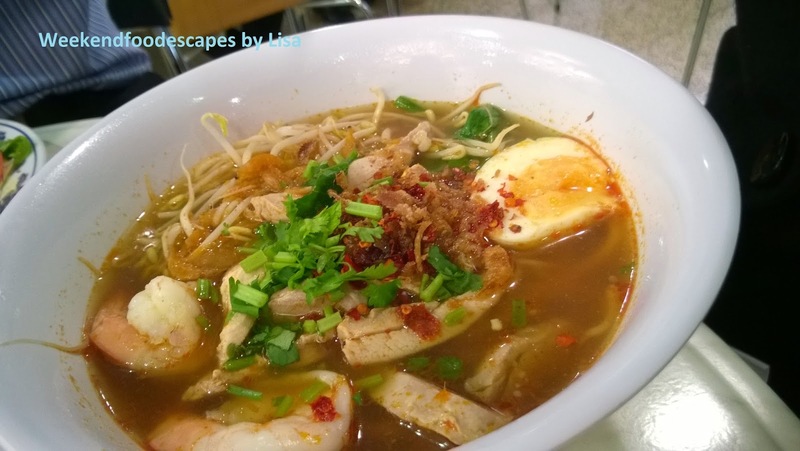 Known for their Laska, I personally have been a massive fan of their rice and noodle specialties. On this occasion I ordered the curry with the roti bread (another favourite of mine). Delish baby! A lot is packed into a tiny bowl. My friend got the laska where she hoped there were a few more prawns but plenty of noodles and other accompaniments to test her tastebuds. Get there early if you can as they at times run out of key ingredients. It's a food court setting so it's a cheap and cheerful setting. 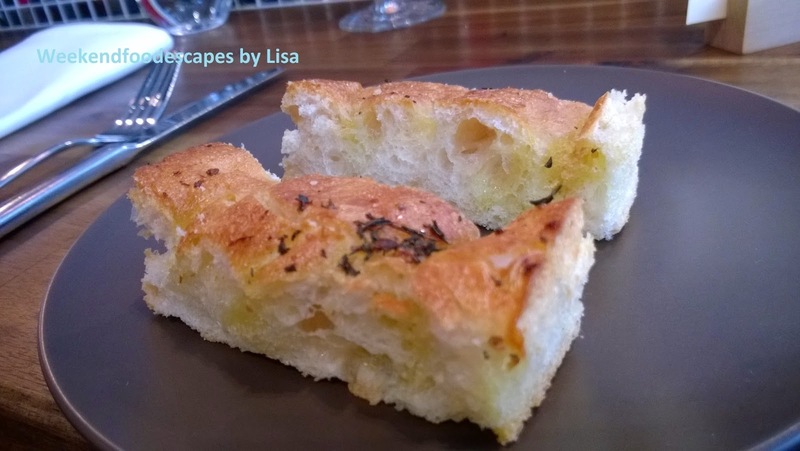 For value, for taste and "OMG" bread and doughs. My family are regulars at this restaurant. For some, it may be a bit of a turn off because it looks like a dirty, greasy, dodgey shop front. Don't be too distracted by aesthetics. If you can cast all of that aside, the food is delicious and worth the drive. If you are looking for a giant pizza; definitely come here for the tasty dough and flavour some wood fired pizzas. I mean MASSIVE size. I'm talking giant, big man, face sized slices. The kebab was pretty awesome too. I love the soft bread. For value. For sure. A definite cheap eat. I read the reviews that described this place as a "tourist trap". I think any Sydney Syder would know that any cafe near circular quay will be over priced. What you're wondering is by how much in price and is the food of quality? 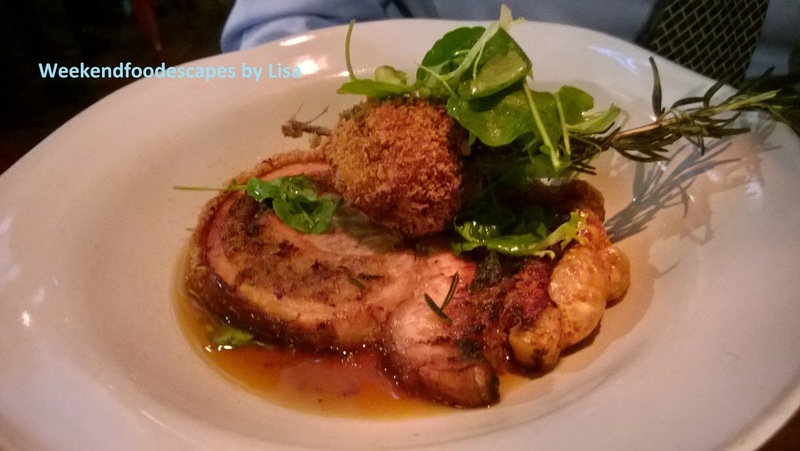 Or does location overtake any need to have quality food, customer service and value for money? I will leave the judgement to you. 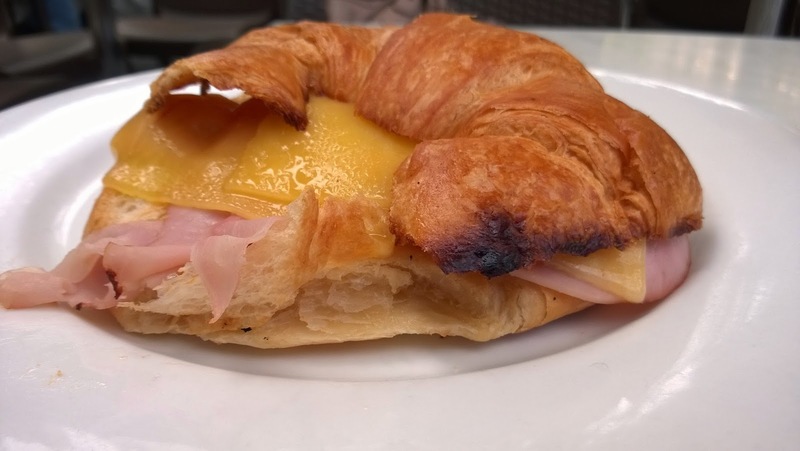 It costs $20 for this croissant and smoothie. I think this cafe has real potential because it does have a great location. If they focused on a few other elements then I think that people would be more than happy to pay for the experience and food. 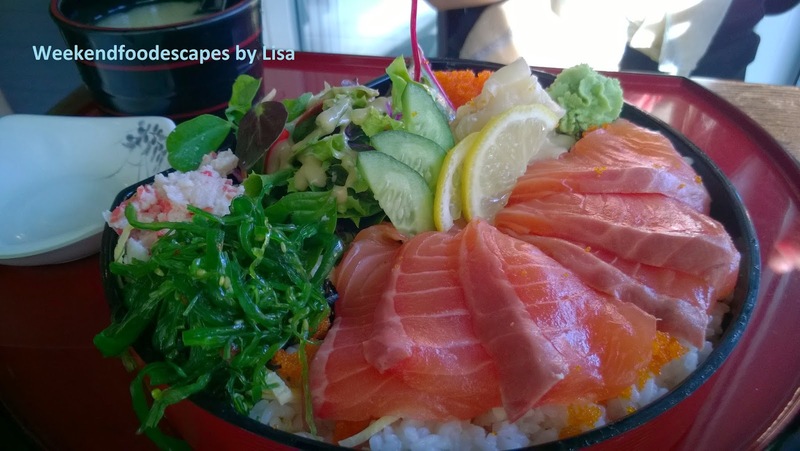 Sakura is in my top 2 in North Sydney for a Japanese lunch. It provides a for value lunch with consistent quality and solid customer service. I've eaten the sashimi a few times and it's fresh and tasty. 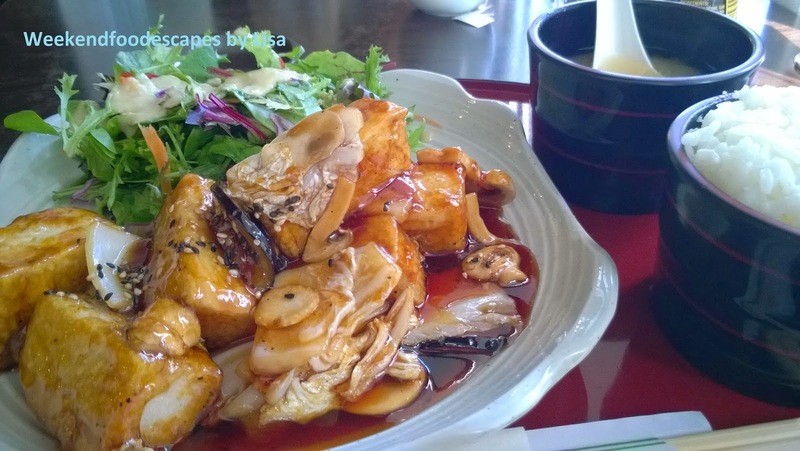 On this occasion I tried the terayki tofu set which was a nice change to the usual Japanese food I order. My work colleague had the sashimi salmon don which was tasty as well. I'm normally not a massive fan of ramen. I'm an udon girl. 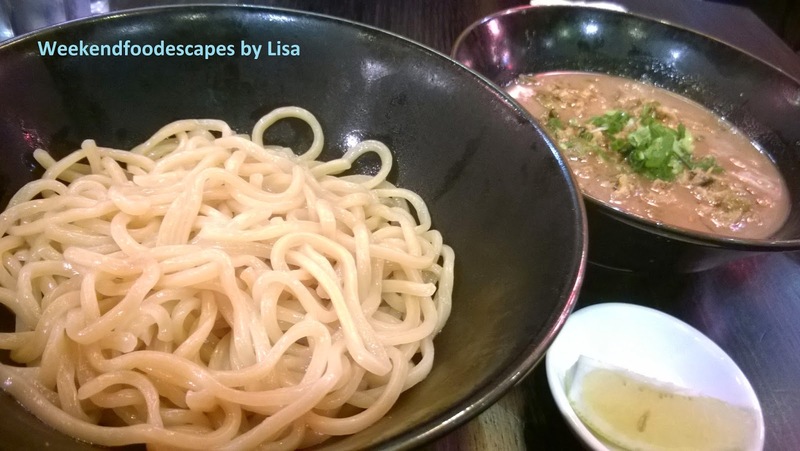 I ordered the $12.90 Tsukemen udon-like noodles with the tonkotsu pork dipping soup. The udon-like noodles were nice. The broth was a bit grainy but it was still nice with a squirt of lemon. It was a nice place for a cheap eat. Nice is the word. I also tried a bit of the Light Zundo Original $11.90, where the broth was amazing but would have tasted better with the udon-like noodles so we ended up mixing it up by dipping the udon-like noodles into the light zundo broth. The regular is a very decent size so unless you are super hungry, I would stick to that size. I've been in Japan recently and had the most amazing ramen in the world. I mean it. The world. It was amazing. 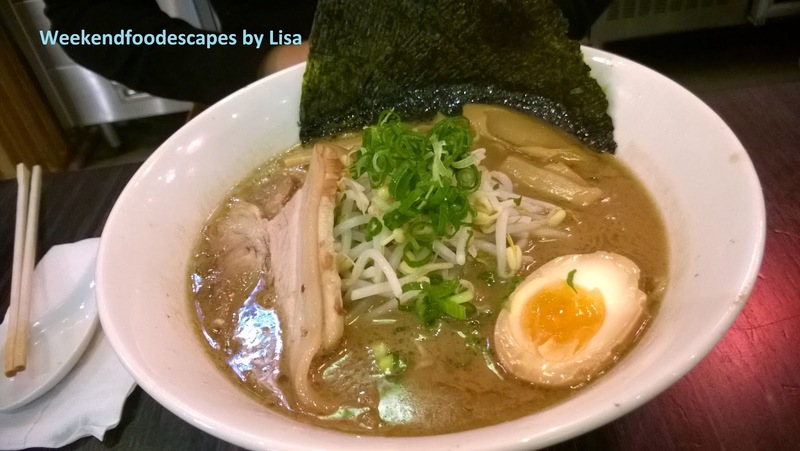 I had been having ramen cravings so this cheap and cheerful place was a good filler. Edit: I've been told that the noodles were not udon but another type of noodle. So I've gone back and just said they were udon like to me! What is going on Fat Buddha? You have a beautiful space in QVB. You've got a long line of customers eagerly awaiting. There seemed to only be one trolley at the time when I was here and several tables trying to get the attention of your staff. 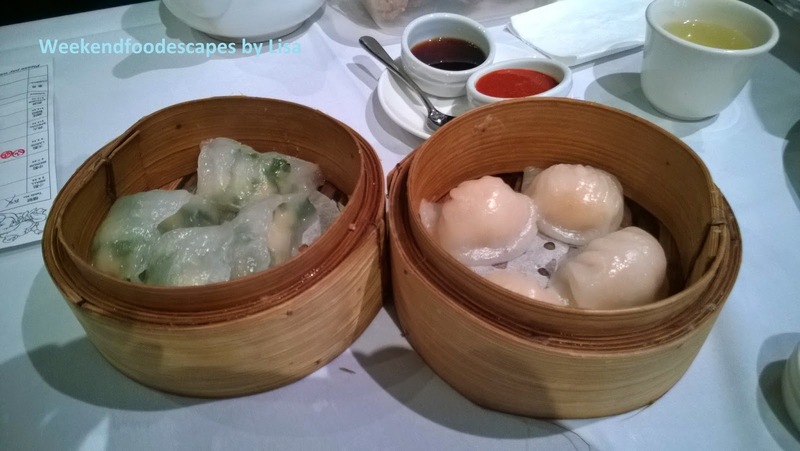 The dumplings were average but come with a premium price.With China town not far; you need to pick up your game. I am highly biased and love asian food. But I am very disappointed in you. I feel like I am a old woman lecturing a young child. Seriously! What is going on Fat Buddha! 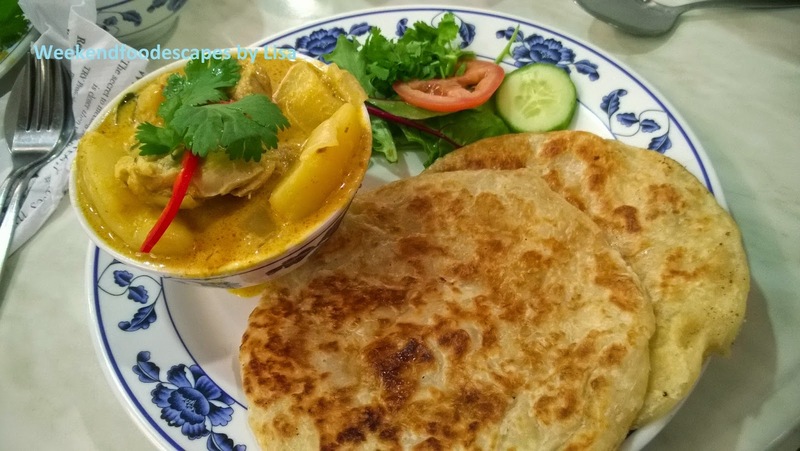 $35 for three dishes and tea. How very expensive!! Sorry Fat Buddha. I'm not even sure I would come back. I'd like to give you another chance but you've already hurt me severely. My food feelings are hurt. I was really looking forward to a sweet dessert hit. I think cheeky chocolate has a lot of potential but on this busy Saturday night - it was busy and the customer service was appalling. I ended up asking for a refund for my hot chocolate after a considerable amount of waiting. The caramel hazelnut dome was delivered and demolished very quickly. I've somewhat suppressed this memory though. Bad customer service turns me off. The attendant refunded my money and didn't apologise so I was turned off and that was the lasting impression rather than the dessert. 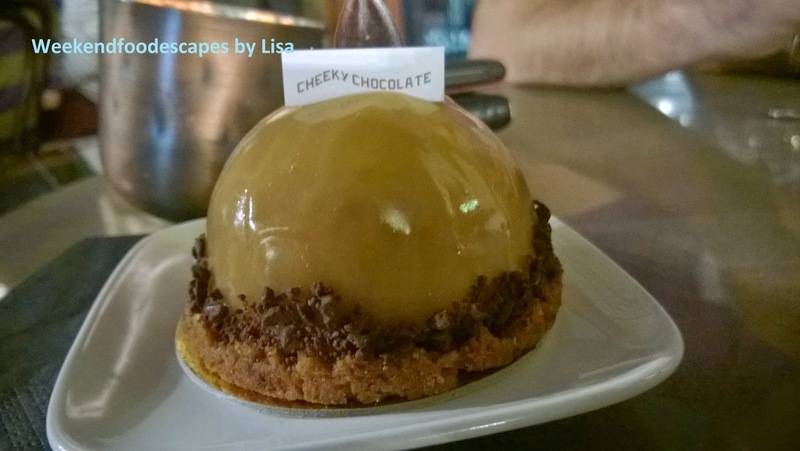 The caramel hazelnut dome was rich with a few different textures. Worth a try - maybe avoid your Friday and Saturday nights so you don't have the same experience as myself. Some restaurants are worth the travel. 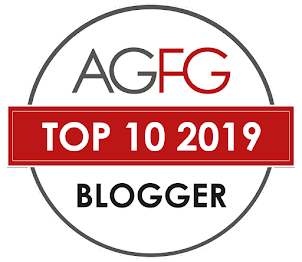 The chicken shop in Belmore, certain kebab shops in Auburn, famous places in Granville... so does Zenobia deserve to be on this list for beautiful middle eastern food? When you enter the restaurant, you have the option of sitting down on a normal table or you can sit down in a cushion lower seat (don't worry, you won't be on the floor). Overall I found the food largely underwhelming. The haloumi was crumbed in a thick dough. It took away the natural saltiness of the haloumi. So over priced at $18 and lacking in taste. The chicken was slightly dry. It was mostly cooked well but just lacked in any real flavour. The rice was perfectly cooked but I just wasn't a fan of any fruit in the rice. I don't think I'd come back. Chocolate, chocolate, chocolate. 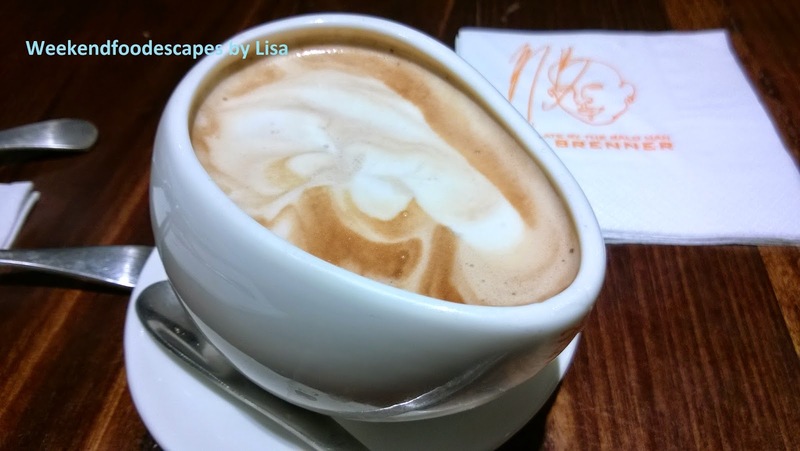 If you dare to encounter the world of richness and want to ignore the political undertones of Max Brenner. There have been claims that Max Brenner has links to other groups that support the Israeli army who are in conflict with the Palestinians. I believe it has been unsubstantiated but there seems to be lots of controversy surrounding Max Brenner. For this reason, I don't know if Max Brenner would be my first choice because I generally want to faint after so much chocolate but also it's a bit pricey for what it is. Secondly, I'm undecided about whether I believe there are direct links. You'll end up paying about $25 for a shared dessert with two drinks. TheWestfield Max Brenner is in a good location. It's sort of the back up dessert places some times. 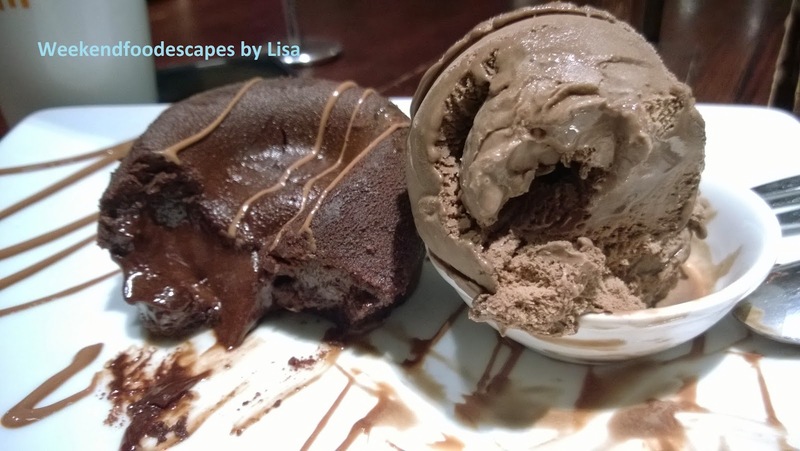 The chocolate souffle has oozing liquid chocolate bliss coming out. Yum. But only in moderation. It's too much with the chocolate drink. I do like the chocolate waffle drink.. sometimes you need a bit of chocolate fainting. 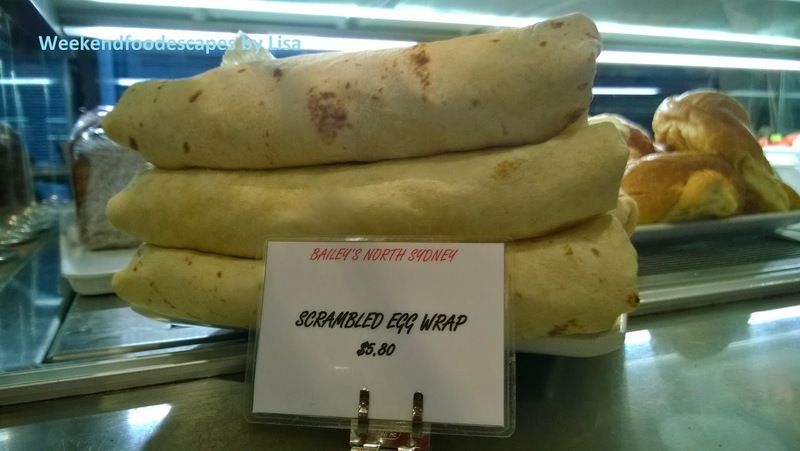 So I have been blogging for about a year now and I've been to Bailey's Cafe a million times for a morning chai latte and on occasion an Egg wrap. 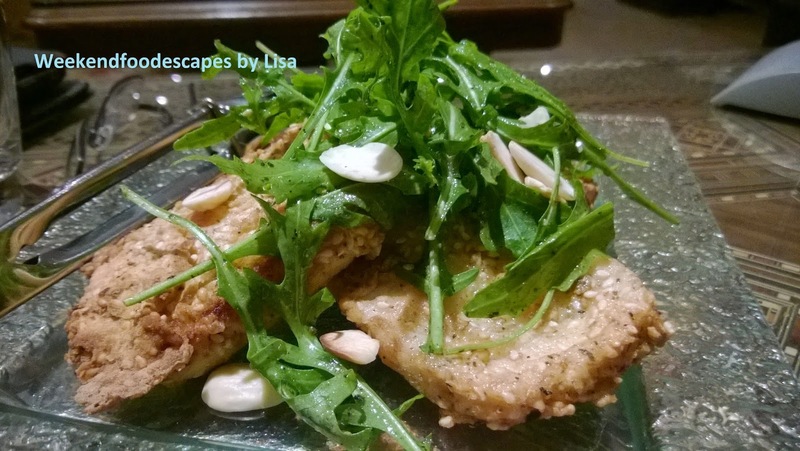 I just haven't been able to blog it because it wasn't on urbanspoon but i've added it to share with the world. It's so consistently tasty. 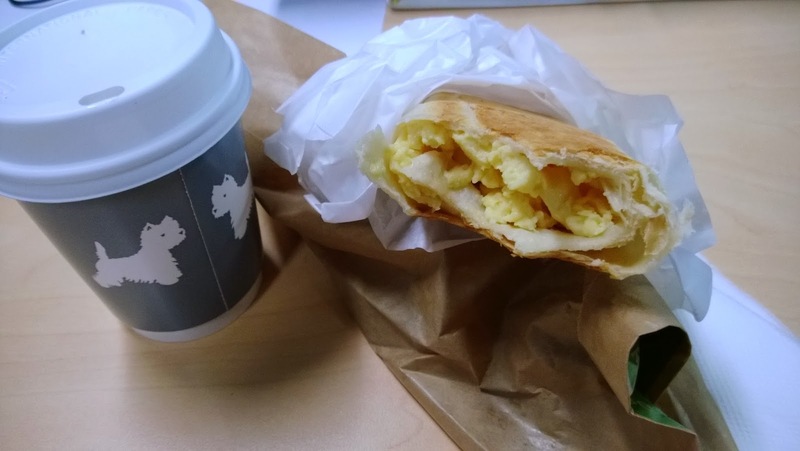 The egg wrap is perfectly cooked with eggs, feta and spring onions on a perfectly toasted wrap. But they are famous for their egg wraps. 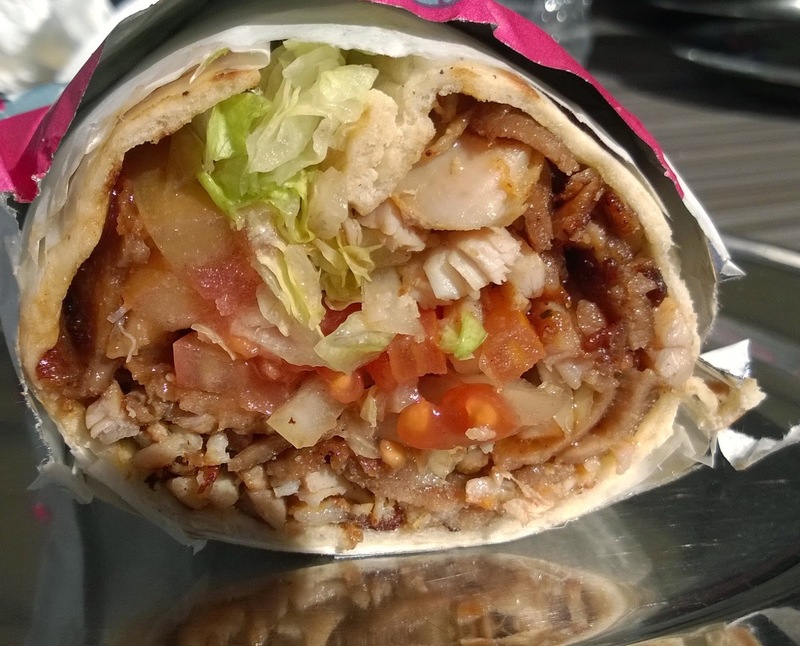 They also do a good lunch which is always full of fresh ingredients in wraps. sandwiches and then you have your meals of fish and chips, nachos and other tasty treats. Expect to spend about $10 for lunch and a bit more with a drink which is your typical North Sydney prices. I have a crush on Jamie Oliver. There is always a massive queue outside Jamie's. I got there at about 5pm and managed to only wait 15 minutes but my friends tell me that you should expect to wait an average of an hour. To be honest, I thought the place was a bit hyped up for what it was. The food was still good. I'm just not sure it would be worth the wait. The pork belly was nice but not amazing. The pasta was different. I found it slightly oily and the scallops were ok. 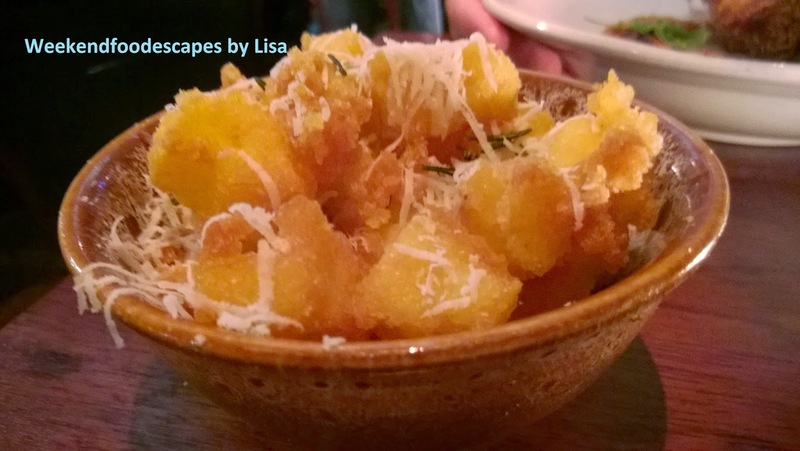 The polenta chips were crispy little cubes. I'll have to come back to try the different food if I have the patience to wait. My waiter Daniel introduced himself to myself and a friend so I felt the need to tell him my name in return. I politely asked him to swap my dirty fork with a new one. The customer service was good ultimately. I asked him how the tip system worked wondering if Daniel would directly benefit. He said he did with a small cut for the chef/front of house staff which I thought was fair. 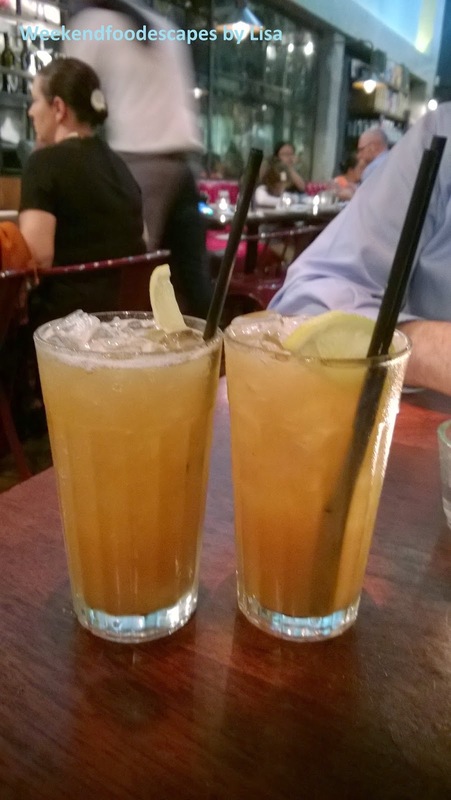 Ice tea for grown ups to start off a good catch up with an old friend. 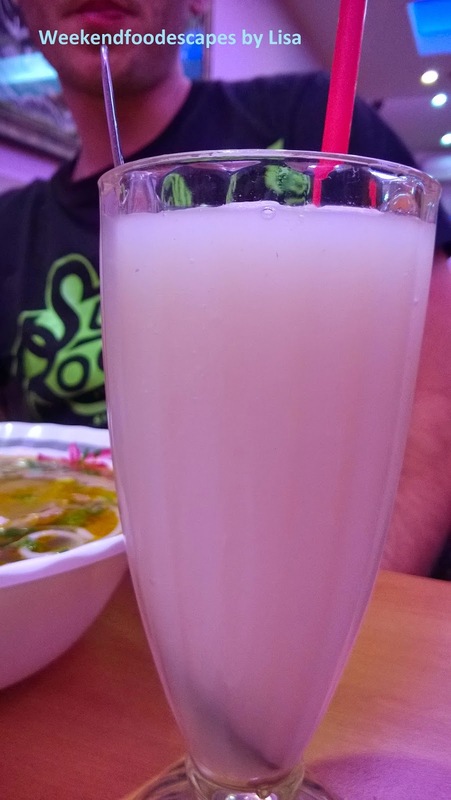 It didn't really taste alcoholic but maybe I am just an advanced drinker. Do you like your wine? 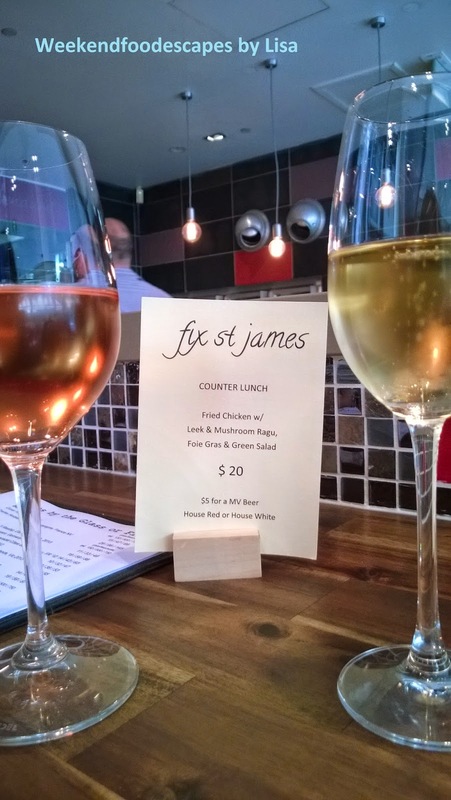 Compare the booze menu with the food menu at Fix St James and fall into wine heaven. A fancy establishment for some classy wine and some classy food. A nice place to have lunch but with the premium price tag. Fix St James is a corporate fancy restaurant during the week. I came here on a day on off with my bestie looking to gossip post-overseas trip with a side of shopping. Start off with a few sips of wine, eat some herb infused bread and prepare yourself for a nice lunch. I ordered the fish of the day which was $35. 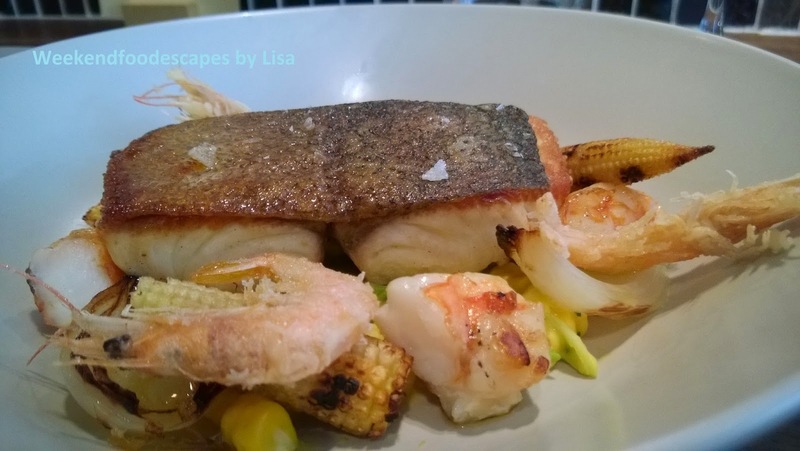 My dish was a king fish which was perfectly cooked on a corn based bed of baby corn, creamed corn and prawns. A good dish put well together but I would have wanted more moisture on the creamed bed of corn as everything made your mouth dry. Maybe this is where the massive menu of booze should come into play. A nice place. 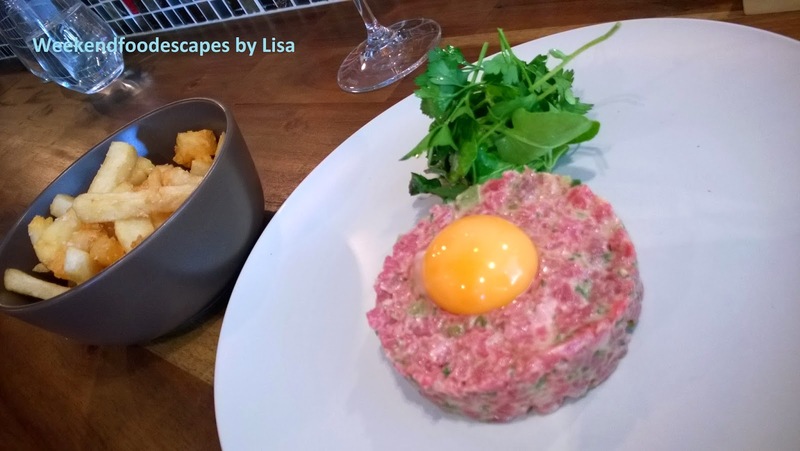 My bestie got the Beef Tartare which was pleasant but you should be a fan. The chips were good. She said "I could probably go without" so I take it that she wasn't a massive fan. I am not a fan of raw meat. The only exception I would make is raw fish. Sashimi me up baby.